One of the things that needs replacing as soon as possible here at the house are the garage doors. We have a three car garage with big, barn style swinging doors. As you can see in the pic we took while we were cleaning up the place before moving in, the whole garage needs a face lift. There is no telling how old these things are and they are in terrible condition. One of them has even fallen off! I have no idea what to look for when it comes to garage door shopping. The site for San Antonio garage doors was very helpful. It provided lots of information on finding a garage door company, making a wise decision on hiring a company, and discusses how important a garage's look is to the curb appeal of your home. I learned a lot from the site. Curb appeal is something we definitely want to improve here. 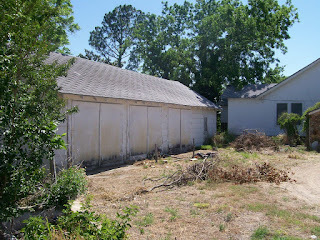 After sitting vacant for eight or nine years our house, out buildings, and property are all kind of run down. We are slowly but surely working on it. The garage doors are a project I'd love to have done right now! They would make the whole place look so much better! I know, one step at a time. I just can't wait to be done with this house!